Star Bulk Carriers Corp. (the "Company" or "Star Bulk") (Nasdaq: SBLK, Oslo: SBLK-R), a global shipping company focusing on the transportation of dry bulk cargoes announced today that it has entered into an en bloc definitive agreement with entities affiliated with E.R. Capital Holding GmbH & Cie. KG (“E.R.” or “Sellers”), pursuant to which the Company will acquire three (3) firm operating dry bulk vessels (the “Step 1 Vessels”) within 2018 ( the “Step 1 Acquisition”), and four (4) optional operating dry bulk vessels (the “Step 2 Vessels”) in 2019 (the “Step 2 Acquisition”), and together the “Vessels”. Subject to agreeing a three party novation agreement with charterers and E.R., any charterparties existing at the time of the deliveries of each of the Vessels shall be novated to Star Bulk. The Step 1 Vessels will be acquired for an aggregate of approximately 1.34 million common shares of Star Bulk (the “Step 1 Consideration Shares”) and $41.70 million in cash. The number of Step 1 Consideration Shares to be issued is subject to adjustments for the Company’s cash, debt and remaining capital expenditures as of one business day prior to the delivery date of each of the Step 1 Vessels. The cash portion of the consideration for Step 1 Vessels will be financed through proceeds of a new five-year term loan of $41.0 million from a major European commercial bank. Following the consummation of the Step 1 Acquisition, E.R. will own approximately 1.45 % of SBLK common shares. 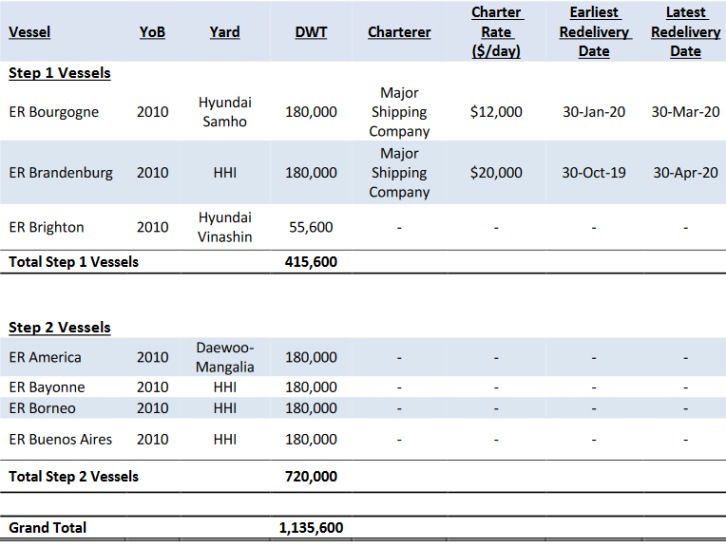 In relation to the Step 2 Vessels, the Sellers have granted four call options to the Company for an aggregate exercise price of $115.39 million or $28.85 million per Step 2 Vessel (the “Call Options”), exercisable on April 1st 2019. Concurrently, the Company has granted four put options to E.R. with an aggregate exercise price of $105.39 million or $26.35 million per Step 2 Vessel (the “Put Options”) exercisable by E.R. from April 2, 2019 to April 4, 2019 (inclusive), in the event that the Company does not exercise the Call Options. The aggregate exercise price of the Call and Put Options is payable in either, 2/3 cash and 1/3 common shares of Star Bulk (the “Step 2 Consideration Shares”), or 100% cash, at the option of the Company. The number of Step 2 Consideration Shares to be issued to E.R. (if any), will be determined by the net asset value of the Company, which will be based on the average vessel valuations by independent vessel appraisers as of March 31, 2019 and will be subject to adjustments for the Company’s cash, debt and remaining capital expenditures as of one business day prior to the delivery date of each of the Step 2 Vessels. The deliveries of Step 1 and Step 2 Vessels (subject to the exercise of the Call or Put Option) remain also subject to customary closing conditions, including the novation of any existing charter parties of the Vessels. The Company expects to take delivery of Step 1 Vessels in Q4 2018, while Step 2 Vessels deliveries, subject to the exercise of the Call or Put Option, are expected to take place between early April and mid July 2019. After giving effect to Step 1 Acquisition and Step 2 Acquisition, Star Bulk will have a fleet of 115 vessels on a fully delivered basis, aggregate cargo-carrying capacity of approximately 13.39 million deadweight tons and vessels with an average age of 7.5 years. Star Bulk is a global shipping company providing worldwide seaborne transportation solutions in the dry bulk sector. Star Bulk’s vessels transport major bulks, which include iron ore, coal and grain, and minor bulks, which include bauxite, fertilizers and steel products. Star Bulk was incorporated in the Marshall Islands on December 13, 2006 and maintains executive offices in Athens, Greece. Its comm on stock trades on the Nasdaq Global Select Market under the symbol “SBLK” and on the Oslo Stock Exchange under the ticker “SBLK R”. On a fully delivered basis, Star Bulk will have a fleet of 111 vessels, with an aggregate capacity of 12.67 million dwt, consisting of 17 Newcastlemax, 20 Capesize, 2 Mini Capesize, 7 Post Panamax, 35 Kamsarmax, 2 Panamax, 16 Ultramax and 12 Supramax vessels with carrying capacities between 52,055 dwt and 209,537 dwt. The Company holds call options and has sold respective put options on 4 Capesize vessels, with exercise dates in early April 2019.